The telescopic cylinder types listed are executed in construction with the piston rod side seal. 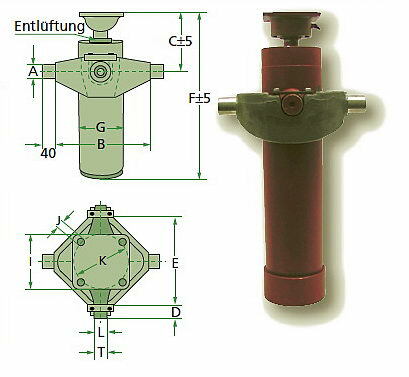 At the cylinder surface are hinge pivot with a gimbal . The last stage piston is provided with a bore . A time-tested snap ring design combined with low wear stripping and sealing elements made of polyurethane ensure reliability and low lubricant film thickness . Proven standard lip seals and scrapers made of polyurethane ensure low lubricant film thickness and good wiping . from -10 to + 80 ° C.
Mineral oil or bio-oils ( after consultation ) . Viscosity of 10 to 300 cst . Test pressure 220 bar . The extending piston stages are hard chrome plated . The Installation, Operation , and Maintenance Manual must be observed! Bleed screw from the piston diameter 75 mm upwards . Preferred areas of application : The single-acting telescopic cylinders are designed mainly as tipping for agricultural trailers - 2 side tilting . It is a stroke limitation provided for preventing that the cylinder be driven to its end stop . Swivel angle of max. 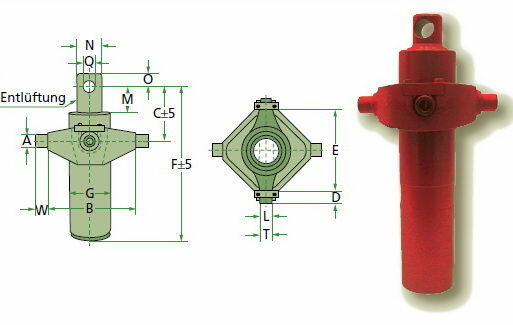 27 ° -30 ° Design principle : The telescopic cylinder types listed are executed in construction with the piston rod side seal. 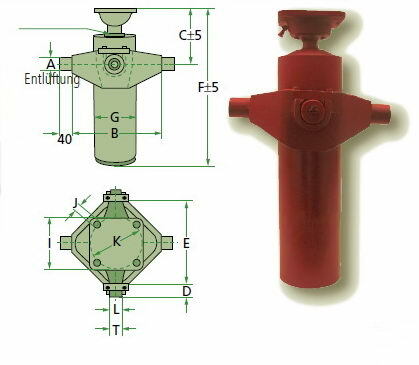 At the cylinder surface are hinge pivot with a gimbal . The last stage piston is provided with a bore . A time-tested snap ring design combined with low wear stripping and sealing elements made of polyurethane ensure reliability and low lubricant film thickness . Seal assembly: Proven standard lip seals and scrapers made of polyurethane ensure low lubricant film thickness and good wiping . Loading speed range: to 0.1 m / s Temperature range: from -10 to + 80 ° C. Hydraulic Pressure medium: Mineral oil or bio-oils ( after consultation ) . Viscosity of 10 to 300 cst . Nominal pressure: Nominal pressure 200 bar. Test pressure 220 bar . Piston rod version : The extending piston stages are hard chrome plated . The Installation, Operation , and Maintenance Manual must be observed! Advantages: ISO 9001 certificate , primed surface , chrome step tubes , high pressure rating Bleed screw from the piston diameter 75 mm upwards . The above-mentioned parts are not original parts. The original numbers are quoted for reference purposes only. The prices are denominated in PLN and do not include VAT. © 2009 Reproduction in whole and parts of the directory without written authorization is strictly prohibited. Prices do not constitute an offer within the meaning of the Civil Code. We reserve the right to make any mistakes. We sale while stocks last.